NLRA Tour regulars Cole Schill and Mike Balcaen used a break in the series schedule to pick up their first wins of the 2013 season during the last week. In Schill's case, it was also his first career victory. 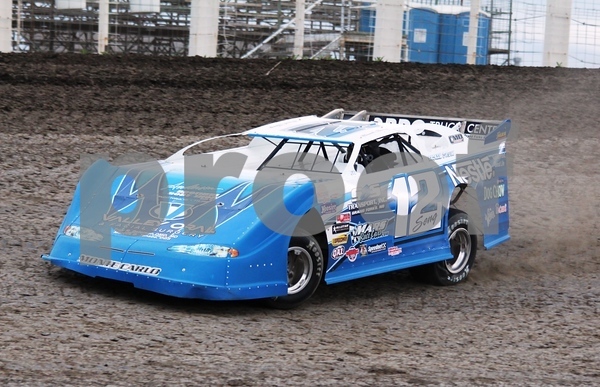 Schill lead the first seven laps of the main event at the River Cities Speedway back on June the 14th when the rains came, ending the night early, and forcing a make-up later in the season. That make-up came last Friday night, and this time Schill picked up right where he left off, leading all 20 laps, parking his No. 44 Quaker Steak and Lube Rocket in victory lane. Brad Seng captured his second consecutive NLRA victory Thursday night, when the series made its' second appearance at the Norman County Raceway in Ada, MN this season. Seng, driver of the No. 12S S&S Transport Mars MB Custom, became the second driver in NLRA series history to win 20 features, second only to the late great John Seitz, who still leads the NLRA all time wins list with 26 triumphs. Seng was running second with two laps to go when race long leader Donny Schatz was penalized for purposely spinning a car he was attempting to put a lap down. Schatz won his heat race, and drew the pole for the main event. NLRA regular Joey Pederson will look to stay undefeated twice tonight at the River Cities Speedway. Pederson, driver of the No. 7P Dahlstrom Motors Mars MB Custom will try to win his fourth feature of the season at River Cities in his late model, then he will try to complete the three-peat in the River Cities Speedway school bus races. Pederson is the events' only winner, having won the previous two events for the Sacred Heart school. He also won in his late model on school bus night the previous two seasons. The annual school bus race night at the River Cities Speedway was started in 2011 as a fun way to benefit area schools. The NLRA's Season continues Thursday night July the 18th when the NLRA makes it's second appearance this season, and its' tenth visit all-time to the Norman County Raceway in Ada, MN. Zach Johnson of Kensington, MN won the previous race at the 3/8 mile oval, dominating most of the main event. Dustin Strand, and his No. 71S Q&Z Plumbing & Heating Millenium finished second, while Ricky Weiss settled for third. Brad Seng in the No. 12S S&S Transport Mars MB Custom, and Donny Schatz rounded out the top five. Cody Skytland, Mike Balcaen in the No. 10 Northstar Canada Victory Circle, Bill Mooney in the No. 2 Freehearingtest.ca Rocket, Jeff Provinzino, and Brian Bernotas rounded out the top ten. Steve Anderson, driver of the No. 9 Hi-Per Flex Panel Systems Pierce, was the hard charger, finishing in the 13th position after starting the race in the 23rd spot. Racing begins at 7pm. Two NLRA drivers remained hot at local tracks last week, as Joey Pederson, and Steffen Snare picked up victories. Last Thursday night, Steffen Snare, driver of the No. 71 Todd's Electric Swartz, captured his second win of the season at the Red River Co-Op Speedway near Winnipeg, MB. Then on Friday night, Joey Pederson, driver of the No. 7P Dahlstrom Motors Mars MB Custom, remained undefeated this season at River Cities Speedway in Grand Forks, ND, winning his third race in as many nights. Some other NLRA regulars who had strong runs include Mike Balcaen, driver of the No. 10 Northstar Canada Victory Circle, who scored a pair of top five finishes, both in Winnipeg and Grand Forks.